A wolf just outside the yard, in broad daylight, intent on tearing the carcass of a deer ../.. in Villaretto Chisone, a village of Roure in Val Chisone, where a few days ago, a wolf approached the home of Daniel Valter ../… very tranquil, even though in broad daylight and near neighboring houses. The below video is an example of the hybrid wild canines being found all over Europe and being passed off as real wolves. These same hybrids are being protected, even to the point of serious criminal charges being levied against hunters who shot and killed one of these. Note the coloring, pointed ears, convexly curved forehead, elongated and narrow snout, short legs, short body, and up-curved tail. In addition, when an educated person considers the diseases these animals carry, specifically Echinococcus granulosus, note that aside from a few people wearing rubber gloves, very little care is taken to prevent the spread of potentially hazardous tapeworm eggs. I.E. the animal was examined in the mouth, on site, without gloves; lifting the animal and making contact with regular clothing; placing of the carcass into a plastic bag again taking little care; tossing into the back of a vehicle presumably used everyday by government officials; and even once to the laboratory, little care is taken. And more from France here. Farmers and hunters in Sweden are crying foul over a wolf hunt ban they say threatens their way of life and may lead to civil disobedience. “I think we could live with some wolves but not as many as there are now. They’re getting too close to people,” Elsa Lund Magnussen told AFP at her small sheep farm and abattoir outside Karlstad in south-central Sweden on Friday. She pointed through the driving snow to a wooded area a stone’s throw from her traditional red wooden house and sheds. Even though in Italy wolves are protected by law, it appears the citizens are taking the law into their own hands, as they well should. 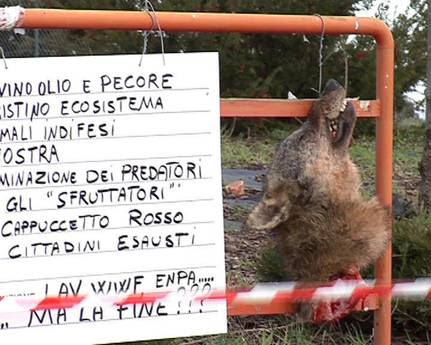 Tired of the onslaught of attacks and destruction of property and threats of attacks on humans, some in Italy have taken to killing the wolves and displaying the decapitated heads at the entrance to the town in a fashion described as similar to signs posted by construction workers at construction sites. This is a link to the original article in Italy. This is the link to the translated to English version. 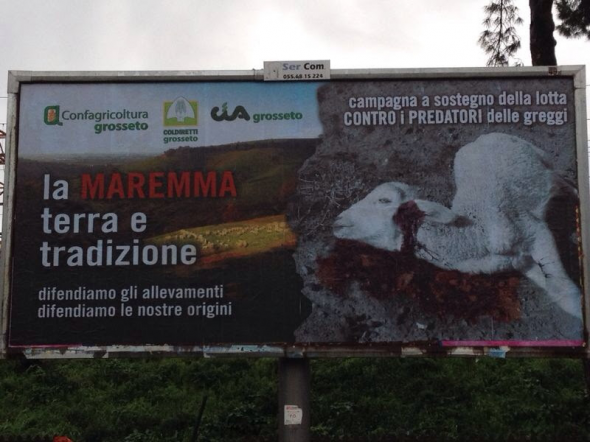 This surplus killing of sheep by wolves happened just outside of Milan. The map below shows better the region. 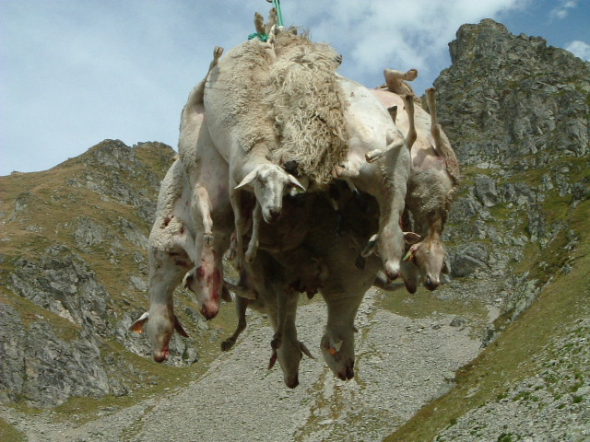 In this photo, a helicopter is being used to remove stacks of slaughtered sheep caused by wolves. Note: While not confirmed, I do not believe this helicopter air lift of slaughtered sheep is part of the above sheep slaughter. The photo is intended to give readers an idea of the huge problem wolves are giving people in Europe. Avila UCCL wolf denounces the attack which took place last Tuesday in a farm located in the place “Riomonte”, located between the industrial area and the city Vicolozano Bernuy Salinero, in the town of Avila, who had the resulted in the death of a calf 20 days of life, and Charolais cross Avileño, with a market value of about 500 euros. It was George Bernard Shaw who said, “If history repeats itself, and the unexpected always happens, how incapable must Man be of learning from experience.” Many pretend to have truth as to why settlers all across America and around the world went out of their way to kill wolves. Not intending to discuss those reasons, the fact remains that wolves were killed by the people and rational thinking leads us to believe it was for good reasons…..mostly. But we have failed miserably as a society, “incapable” of “learning from experience” and thus a handful of “True Believers” insist on recreating history and the misery endured by the people of decades ago by protecting wolves and large predators, seemingly at the cost of human life. In reading an article this morning in the AOL Travel section in the United Kingdom, it seriously took on the image of reading history from the adventures of settlers moving into the landscape of the West, except in reverse. 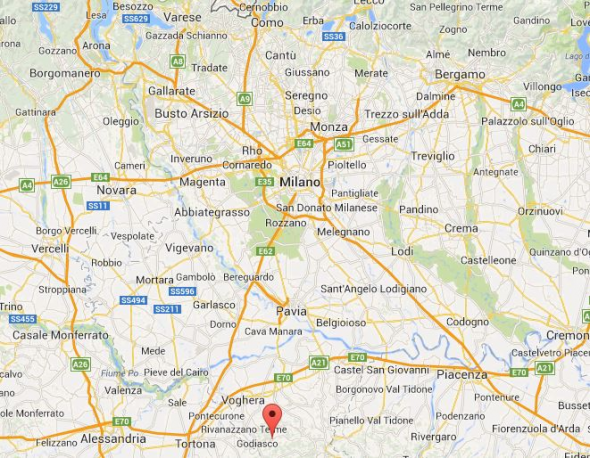 Due to circumstances in the Tuscany region, wolves are being forced into populated areas, where the food is. 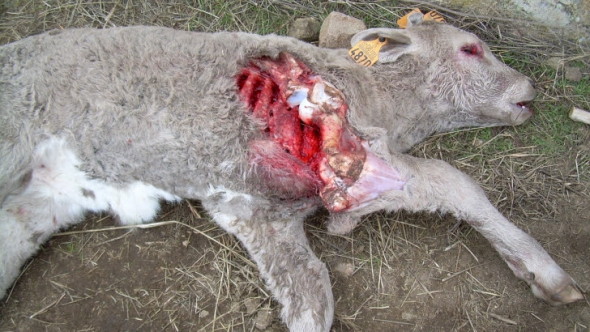 As a result, livestock and pets are being killed and attacks on humans are imminent. Once again I am reminded of Dr. Valerius Geist’s seven stages of when wolves become dangerous to humans. We must learn. According to the report, heavy snows and cold have driven the prey base of the wolves to lower elevations. This of course being the living habitat of humans. As a result…..disaster! There are wild wolves galore in Europe. ‘While we think of wolves as masters of the wilderness in Europe, they thrive in human-dominated landscapes.